Combining the same practicality and running cost benefits of the ordinary Picanto, but adding some on-trend styling, the X-Line is arguably the pick of the range. The Picanto is an odd car. Not in a bad way – it’s actually excellent. Oops, I’ve just given the game away. But just in how varied the range is. At the entry level it’s something of a budget city car, it’s sub-£10,000 price tag giving away the bare bones nature of the car. However, splash out and there’s the possibility of turning it into a tiny luxury car, bestowed with climate control, heated seats, cruise control, satellite navigation, and countless other ‘big car’ features. A GT-Line model adds sporting pretensions, with bold styling provided by big alloy wheels, twin exhausts and red flashes. It’s not all show – The X-Line rides higher, although only by 15mm. If that’s not enough, there’s now a pseudo-SUV version that toughens up the plucky Picanto in the way the Vauxhall Adam Rocks or Dacia Sandero Stepway does. 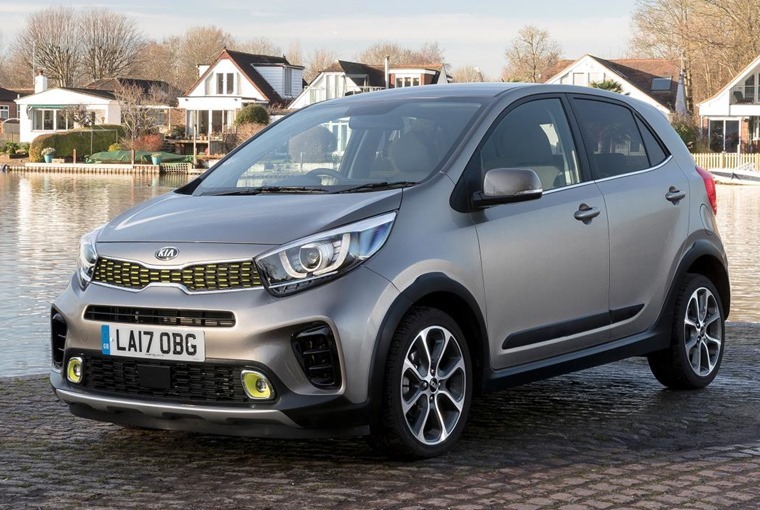 The changes are mostly cosmetic, with front and rear bumpers that include a silver skid plate at each end, black side sill mouldings, and wheel arch extensions that make the Picanto look like it’s riding higher. A damp grassy field will prove too much though, as there's no four-wheel drive. It’s not all show - it does actually ride higher, although only by 15mm. 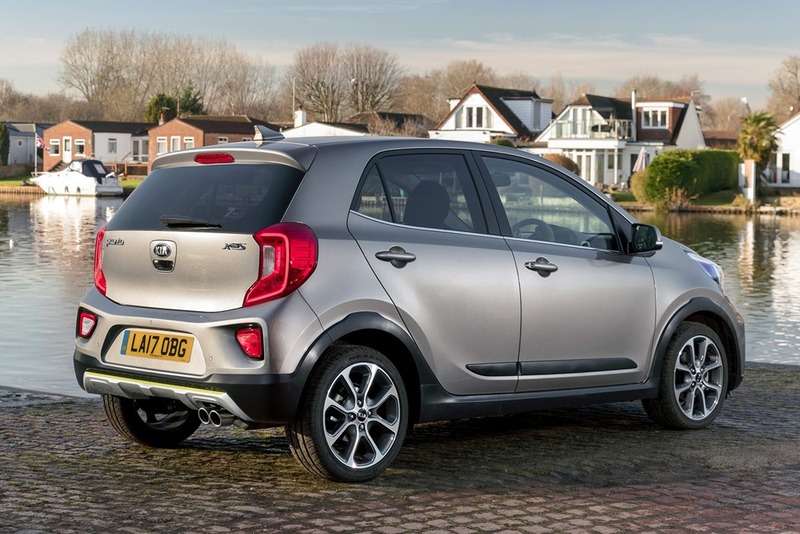 That’s not enough to pick up your Picanto and start looking wistfully towards the Gobi desert, but it is enough to make crossing a grassy field at the car boot sale a little more comfortable. A damp grassy field will prove too much though as there’s no four-wheel drive or high-tech traction control system included to back up the beef that’s been added, so you’re stuck with front-wheel drive and delicate use of the throttle. The Picanto still turns in sharply and feels surprisingly planted through corners. Pressing it all the way won’t reveal a raucous race-bred engine hiding under the bonnet, but the 1.25-litre petrol engine is characterful and powerful enough to make motoring easy. 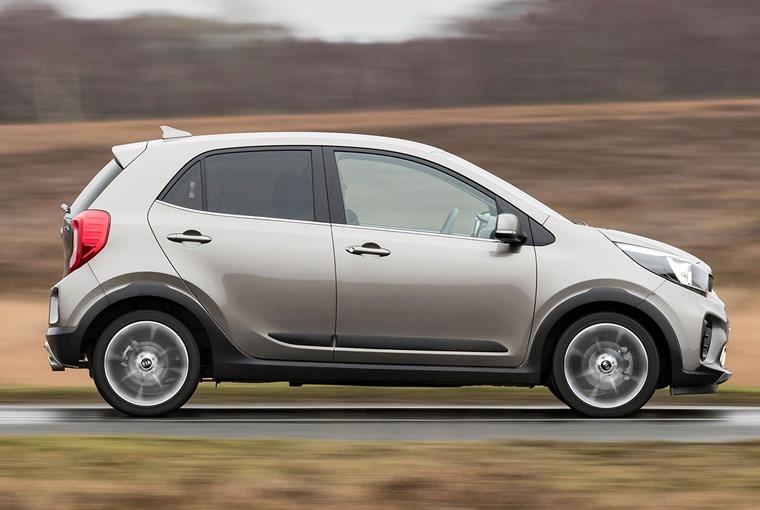 Granted, 83bhp isn’t going to set any pulses racing, but it’s enough to power the Picanto to 62mph in 11.6 seconds. It actually feels quicker than that, but the stopwatch doesn’t lie. The firm suspension adds to the feeling of (relative) performance, but does mean potholed urban roads upset the ride. 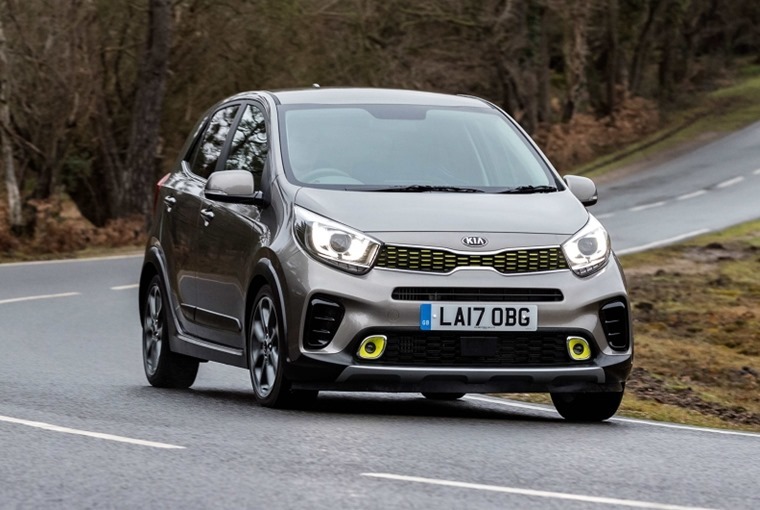 The raised ride height means there’s a little more body roll than normal, but the Picanto still turns in sharply and feels surprisingly planted through corners. It’s a car that could be enjoyed on a cross country drive, something that is unusual in this sector. Head into town and the diminutive nature of the car, along with great visibility from large windows, make it wonderfully easy to navigate the urban sprawl. 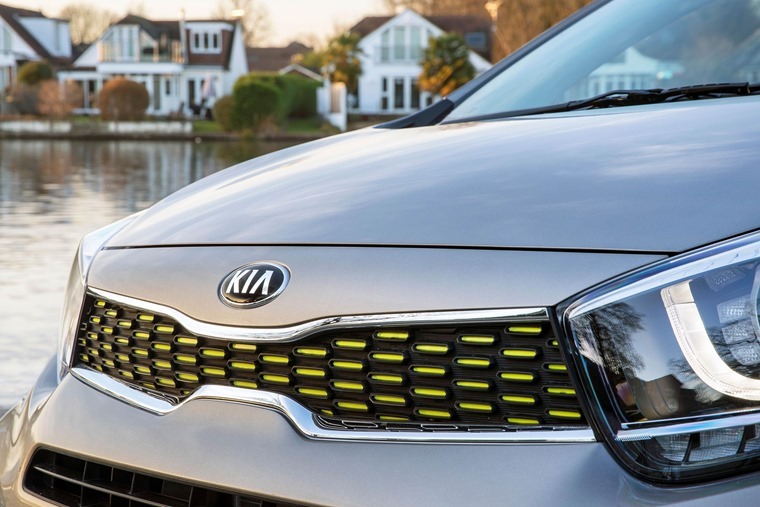 Kia has thrown all of its toys into the X-Line, loading it with equipment. Inside there are comfortable seats with enough room for two burly men to drive along without rubbing elbows too frequently. There’s just about enough room behind for adults to sit comfortably for shorter journeys, and more than enough room for kids. Even the boot is a decent size, swallowing 255 litres of things that you put in the boot, which expands to an impressive 1,010 litres with the rear seats folded away – that’s about the same as you’ll find in the larger, more expensive, Ford Fiesta. Kia has thrown all of its toys into the X-Line, loading it with equipment. 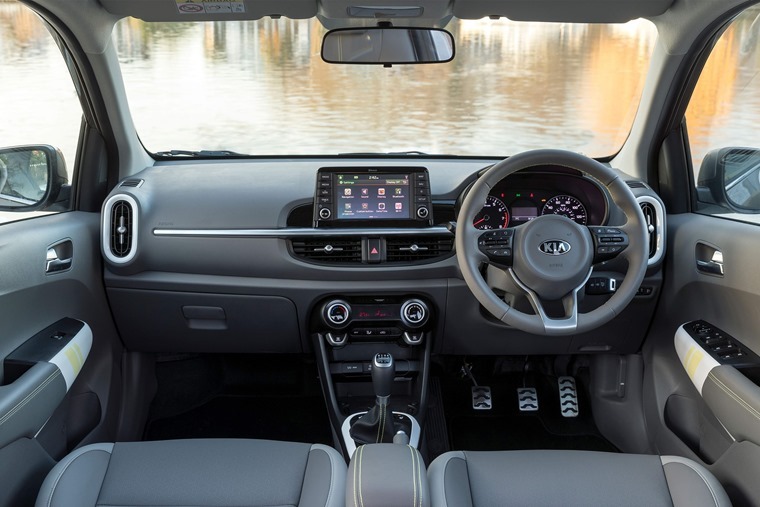 Air conditioning, a seven-inch touchscreen infotainment system, DAB radio, smartphone mirroring with Apple CarPlay and Android Auto, and a reversing camera all come fitted as standard. There’s also automatic emergency braking, which helps the car achieve its four-star EuroNCAP crash safety rating. There’s no problem with running costs, at least officially. There’s some bright highlighting inside, with splashes of gloss-white on the air vents and door handles, with a couple of lime-green flashes running through them. They match the lime-green detailing on the exterior, but don’t work very well inside, jarring obviously with the otherwise rather sober dashboard. The artificial leather seats also have some lime green stitching which, paradoxically, works very well. Perhaps it’s the white that’s the problem. A few negatives aside, it’s a remarkably positive showing for the X-Line. There’s no problem with running costs, at least officially. The 61.4mpg promised is more than a tad optimistic, but the car is powered by a small engine so won’t drink petrol too quickly, while low CO2 emissions of 106g/km will keep the tax man happy. Car tax is the fixed rate of £140, but company car drivers will benefit from a BIK burden of just 22%. Add in a seven year warranty and the X-Line won’t cost a lot to run. A few negatives aside, it’s a remarkably positive showing for the X-Line. 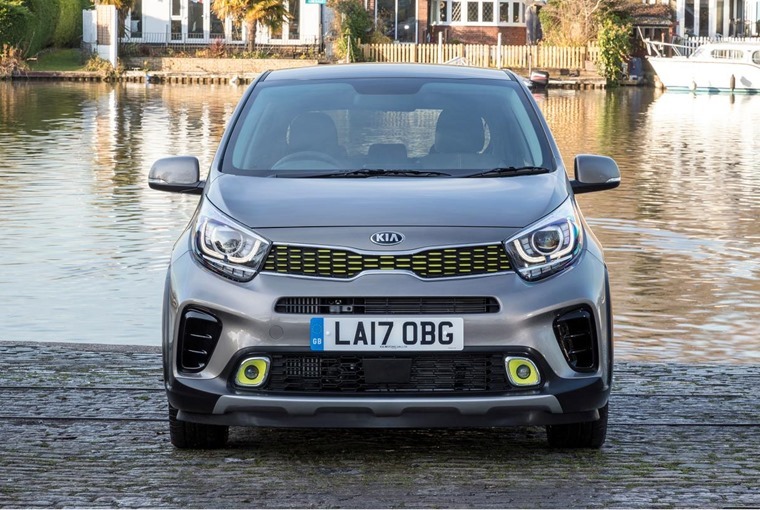 It’s arguably the best model in the Picanto range, offering all the practicality and running cost benefits of the Picanto, but with some bang-on-trend styling thrown into the mix. The asking price might be a tad steep for some, but finance rates are competitive, with the X-Line additions being just a small monthly increase, and they might just be worth it. Rides 15mm higher than standard Picanto and stands out thanks to chunky bodywork, but not everyone will like the green highlights though. Lots of dark plastic but full of kit and well put together considering its class. 83bhp 1.25-litre engine doesn’t sound a lot, but makes excellent progress. Despite its looks muddy fields should still be avoided if at all possible. 255-litre boot can be increased to 1,010 litres with rear seats down – that’s on par with the much pricier Fiesta. Thanks to relative low weight and small engine its claimed 61.4mpg isn’t too unrealistic.